2LT Johnny Craver died October 13, 2006, from injuries sustained when an improvised explosive device (IED) detonated near his vehicle during combat operations as he was entering the Green Zone in Baghdad, Iraq. He is survived by his wife, Natalie; daughters, Casondra, Savanah, Emma; son, Caelen; and parents, Phyllis and Kenneth. In 1994 when Johnny was 17, he came to his mother with enlistment papers for her to sign. “I told him, ‘You go look at that room of yours. They won’t let you keep a room that messy,” she said. “But he was determined to join, and when he finished high school, he did”. During his extensive career he became an Army Ranger, and later a Ranger Instructor, and was commissioned a Second Lieutenant after completing Officer Candidate School in 2005. That same year he participated in the 2005 Best Ranger Competition. At the end as he and his partner started up a steep hill, his partner twisted an ankle. Johhny took his partner’s 80-pound backpack and carried it, along with his own, to the top of the hill, while encouraging his partner all the way, saying “It’s okay, I got you covered”. Johnny deployed to Iraq in June 2006. Excerpt from a letter from Johnny’s mother, Phyllis, after receiving her portrait. “In May 2006 my son hit me with something that changed my life forever. “Mom, I’m going to Iraq” was his exact words. I wanted to just sit down and cry. My reaction was “I didn’t think you were going to have to go”. “Well Mom, I volunteered to go so some other dads can come home and see their children”. Johnny had three children of his own. My heart was not in the long drive to Ft. Hood to see him off that hot day in July, but I knew I had to be there. I still hear in my mind the words he kept saying to me, “Mom, I’m going to be alright”. I still have all the emails and cell phone messages from him. The heart wrenching message of hearing his voice on my cell phone and knowing he is gone, telling me he would see me in 5 weeks. Little did I imagine the next time I would see my beautiful son would be watching four soldiers put an American flag on his casket and take him off an American Airlines plane at DFW Airport. From this day on my life has never been the same or never will be normal again. Then, on February 26, 2008, you Mr. Taylor walked into the sheriff’s department and you made my life more meaningful. You brought Johnny home to me and he will remain there till I go to join him in heaven. You will never know what this portrait means to me nor will I ever be able to repay or thank you and Lisa for your act of kindness. The tears poured that night as I watched Johnny come to life again. The extra special way you brought him home to Mom, thank you, Mr. Taylor. You have made a fallen soldier’s mom so happy and proud”. 2LT Johnny Craver was 37 years old from McKinney, Texas. 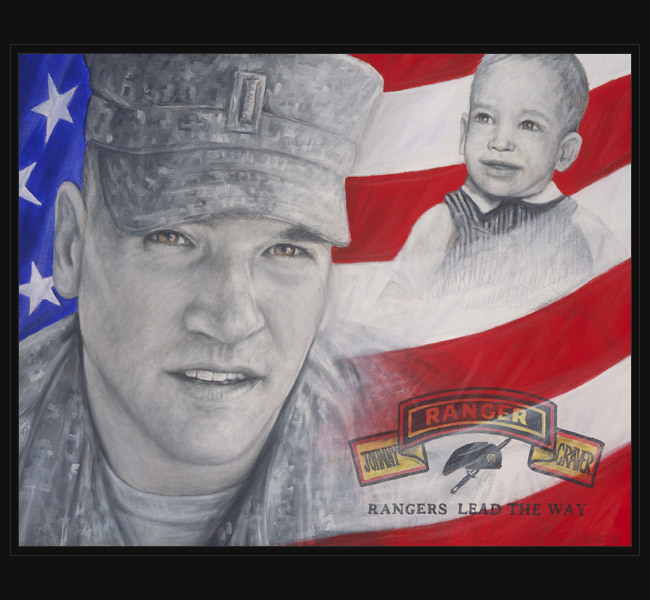 Original portrait was a presented in February 2008 as a surprise to his mother, while she was working in her office at the Denton County Sheriff’s Office.